A young immigrant boy with his few personal belongings tied in a handkerchief and thrown over his shoulder trudged into a young and growing city, and up a street which later became the main thoroughfare of the community. Little did this boy, barely 14 years of age, know when he walked up the present Main street of Stevens Point to the Wisconsin River that he was passing the site on which he would later build a large and imposing home, where he would live with the woman of his choice for nearly 70 years and where he would live to celebrate his own centennial year along with that of his adopted city. L. P. Moen, christened Ludvig Peder in his native country, Norway, and known for many years in public life in ‘Stevens Point as “Louie,” came to the city nearly 86 years ago and will celebrate his 100th birthday next Nov. 10. He arrived in Wisconsin in the spring of 1872 at the age of 13 and came to Stevens Point the following December, which was just after his 14th birthday. Mr. Moen, former public administrator here for many years and long active in civic affairs, came to this country with his father, Peder Moen, from their Norway homestead in Kongsberg. The senior Mr. Moen and his son came ahead to prepare here for the arrival of the rest of the family in a new country. The sone came along because he knew some English which he had learned at school. Their trip here was a long and tedious one. It was made on two ships, the “Hero” and the “Hibernian.” They traveled on one vessel, from Norway to England and on the other from England to Quebec, Canada. En route here, the boy did odd jobs on the ships and also did some translating. Before coming to Stevens Point, the boy worked on a tobacco farm in the Edgerton region in southern Wisconsin for a time and then on a farm in a Norwegian settlement in the Town of New Hope while his father was employed with construction crews building the Wisconsin Central Railroad. It was after his short stay in New Hope that the boy walked to Stevens Point when he believed it was about time for his mother and the other three children in the family to arrive from Norway. However, when he reached the river, someone called to him from a cook shanty on a lumber raft and asked him if he could cook. The lad replied in the affirmative — and he had another job. Without further ado, he boarded the raft, which was ready to leave, and served as second cook or “cookee” on a trip to Dubuque, Iowa. At Dubuque he bought a suit of clothes for $3.75 and a hat for 50 cents, and returned to Stevens Point with these prized possessions. Upon his return he saw for the first time in this country his mother who had arrived in the meantime and who was worried about his safety on the river. The family lived at the boarding house of another Kongsberg, Norway, family, the Christen Haagensens, where Mr. Moen met his future bride. The Haagensens had purchased land on Sept. 24, 1857, at the corner of Franklin and N. 2nd streets, where they built a boarding house. 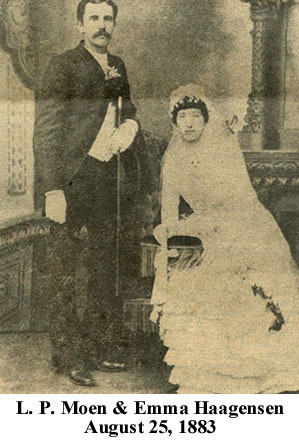 L. P. Moen and Emma Haagensen were married on Aug. 25, 1883. Mrs. Moen died on Aug. 15, 1953, just 10 days before the couple’s 70th weeding anniversary. They were the parents of two daughters, Ellida and Ada. Miss Ellida and her father now live at the family home, 840 Main St., which he built in 1885. Ada, the wife of Charles W. Nason Sr., 836 Main St., died in March 1955. Mr. Moen has two grandchildren, Charles W. Nason Jr., 421 Prais St., and Mrs. Alfred Nimz, Ripon, and five great grandchildren. When Mr. Moen came here as a lad, Mrs. Geraldine Bliss Clark was his first teacher. He then worked as a clerk in the dry goods store of (Henry) Hoeffler and (G. F.) Andrae and later for Mr. Andrae until August 1879 when he established his own dry goods and grocery store on the west side of Water street, between Main and Clark streets, formerly S. 3rd street. He dealt in general merchandise and sold passage tickets to and from Europe. Mr. Moen operated the store until he went into the insurance business which he conducted for many years until he sold the agency to Murat and Dagneau in August 1935. It is now the Murat-Risser-Berndt Insurance Agency at 401 ½ Main St.
On Oct. 1, 1909, Mr. Moen was appointed by County Judge John A. Murat as Portage County’s first public administrator, and he performed the duties of the office under Judges Murat, W. F. Owen and Byron J. Carpenter until his resignation and retirement in December 1950. During his long business career, Mr. Moen served as city assessor for 24 years and as city treasurer for a short period. In the early years of his residence here, he staked a claim in northern Wisconsin, which he homesteaded after living on it for a few months. He sold it to the Brown Brothers. 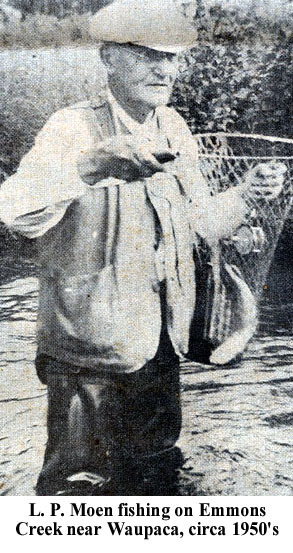 The near centenarian always has been an ardent fisherman and lover of the outdoors through the years and prior to last summer he could be seen frequently on the trout streams. His plans for this summer include some fishing excursions. Mr. Moen also pioneered in camping activities. With his family he was the first to take advantage of Martin’s Island as a camping spot. During their first summers on the island in the Wisconsin River, the Moens camped in tents. Later they built a cottage which they used until the island was flooded by the raising of the water when the power dam of the Stevens Point Division of the Consolidated Water Power & Paper Co. was built. Mr. Moen then built a summer home at Waupaca’s Chain O’Lakes in 1925. Prior to recent years he spent the summers there and now makes frequent summertime visits to the home. Mr. Moen has the distinction of being the oldest living member of Evergreen Lodge N. 93, F. & A. S., which this year also is celebrating its centennial year along with the city and the honored Mason. Mr. Moen joined the lodge on March 20, 1883, and has held continuous membership since. With the exception of impaired hearing in recent years, Mr. Moen always has enjoyed exceptional health and never has been hospitalized. He has kept abreast of the current happenings and is especially interested in sports events, being an enthusiastic fan of the Milwaukee Braves. Television is now one of his greatest interests, especially for sports events. When the Citizens National Bank opened its doors in 1893, Mr. Moen was one of the original depositors. He was always on hand through the years for the annual stockholders’ meeting, attending his last one in January 1956, at the age of 97. He has been a stockholder in the bank for many years. Ludvig P. Moen died July 3, 1958. His obituary appears here.